Some general technical descriptions of cars are so associated with a particular company, it’s hard to imagine them existing in any other context. A four-wheel drive wagon with a flat-four front-mounted engine is hard to picture with any badge other than Subaru, right? That’s why it’s so weird this car was essentially invented by a British/Irish tractor maker. The car is the Fergason R5, and is the first real attempt to make a general-use passenger car — not a jeep or some sort of off-roader — with four-wheel drive. The R5 was before the limited-production Jensen FF (1966) and the later Subarus it so much resembles. 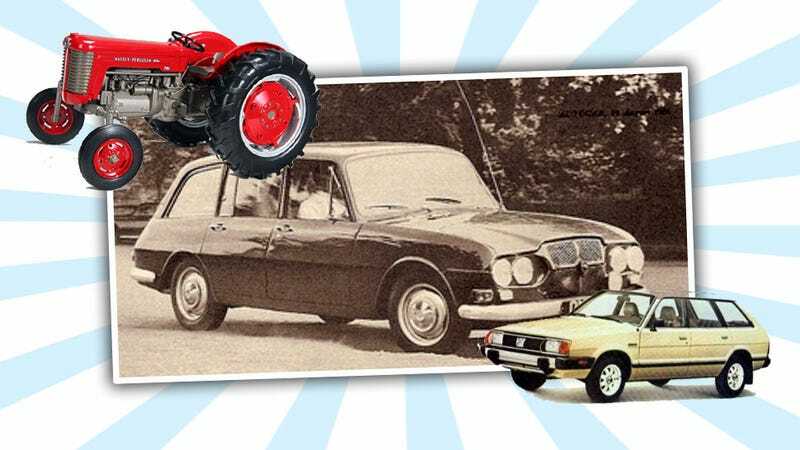 Subaru’s first flat-four, four-wheel drive wagon was the 1300G, made in limited numbers for the Tohoku Electric Power Company in 1971, and then real production began with the Leone in 1972. So, that puts this tractor-company-built car ahead of them all with a basic formula that’s so common now, and not just Subarus. Think about Audis how almost every premium make has an AWD option, and it makes you respect what Ferguson Research did even more. I wasn’t aware of this car until very recently, when my shockingly-regular bowels gave me a chance to flip through a 1967 Popular Mechanics. They had a short little article on the R5, touting it as a car “built for safety.” It sort of looked like a Renault 16 from the rear, but it had four-wheel drive? I was hooked. The company, Ferguson Research, was founded by Harry Ferguson, “the father of the modern farm tractor” and part owner of tractor company Massey-Ferguson. Ferguson (in addition to being the first Irishman to build and fly his own airplane) became interested in 4WD research, and even built the first 4WD F1 car in 1960, the P99. Sterling Moss even called it his favorite F1 car! But it’s the R5 I’m really interested in, because this car in so many ways predicted a kind of car that’s still considered modern today. Listen to what the R5 had: four-wheel drive, anti-lock disc brakes all around, hatchback/wagon body, electric windows, and some of the (Ferguson-developed) 2212 cc boxer engines were even supercharged. All this back in 1965 (some sources list it even earlier, from the late ‘50s)! Also interesting — the manual transmission had an automatic-style torque converter, meaning you could pretty much take off in any gear you wanted. In some ways, it’s a bit like how modern launch control systems work, and maybe has a little in common with the Saxomat/Automatic Stickshift/Sportamatic semi-automatic transmissions used on Volkswagens and Porsches of the era. Styling-wise, the car looks a little like a ‘60s Renault wagon with a front end that grabbed a grille from a time-travelling Dodge Stratus. Overall, it’s a very clean, rational design that really could claim to be the ancestor of any Subaru Forester you’re likely to meet. Ferguson never really got the big manufacturers to license any of its technology, even though many came to the same conclusions years later. As it is, the Ferguson R5 is just an odd little historical footnote, but it certainly deserves our respect.